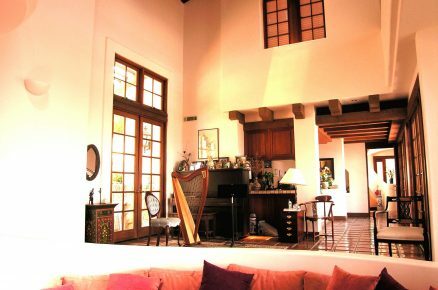 "A 3% carbon footprint for a large home..."
This Spanish Colonial 5,000 sf. home on Loma Media in Santa Barbara features a rock bin heat recycling, a 5.5 Photovoltaic electrical system, earth duct, and solar hot water. In use, this house is about 96% self sufficient, with the grade-mounted photovoltaic system providing 98% of the electrical. 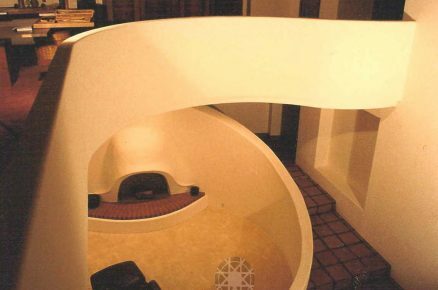 A buried concrete earth duct pre-tempers the air to the furnace, lowering demand, and the rock bin can provide winter warmth and summer coolth as described in the Dzur Residence.